The Driver Type being to be used. The operating Mode of the driver (polled or interrupt driven). The protocol required to communicate with other SPI devices on the board. When the project is generated, MHC will configure the SPI settings according to the selected menu items. Both the Static and the Dynamic drivers provide the APIs needed to configure and communicate using SPI. Both drivers support Standard Mode, Framed Mode, and Audio Protocol Mode. Both drivers can support the enhanced SPI buffer found on some 32-bit MCUs. The benefit most useful to application developers is the Dynamic Driver's ability to share the SPI peripheral among several tasks. This is useful when several different devices are attached to a single SPI channel and each of the applications tasks communication with a different slave device. There are no inherent code efficiency or measurable execution speed benefits between the two driver implementations. 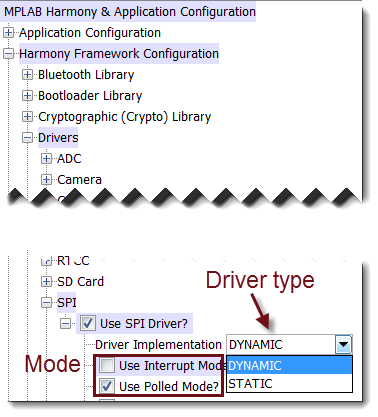 The Dynamic Driver is the most commonly used SPI driver implementation because it allows your application to seamlessly share a peripheral. The Dynamic SPI Driver requires that before communicating with a device connected to an SPI peripheral, the application must OPEN the SPI channel using a call to the function DRV_SPI_Open. This function returns a pointer to the driver (also called a 'handle') if the SPI channel is available. If the desired SPI channel is either uninitialized or in use by another task, NULL is returned by DRV_SPI_Open(). A valid handle, returned from DRV_SPI_Open, is a required parameter for all SPI communication functions using a Dynamic Driver. An application does not have to CLOSE an SPI channel after each communication exchange. The channel can be kept open for an extended period. Moving data between an application's transmit/receive buffers and the SPI peripheral's hardware registers requires the Harmony function DRV_SPI_Tasks to be called. DRV_SPI_Tasks calls, through a function pointer, the specific routine to transfer the data. The determination of which function DRV_SPI_Tasks uses as a callback function is determined by the configuration entered into MHC. The use of different callback functions by DRV_SPI_Tasks has no effect on the application API calls or usage. The application developer is responsible for choosing whether DRV_SPI_Tasks is called as an Interrupt Service Routine or if DRV_SPI_Tasks is to be called on each iteration of the main "while(1)" loop. 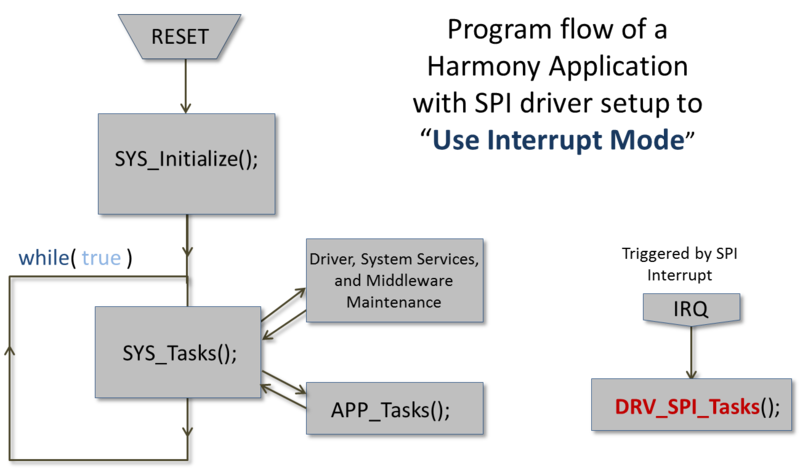 To have DRV_SPI_Tasks trigger by an interrupt the user checks the box "Use Interrupt Mode" in MHC. 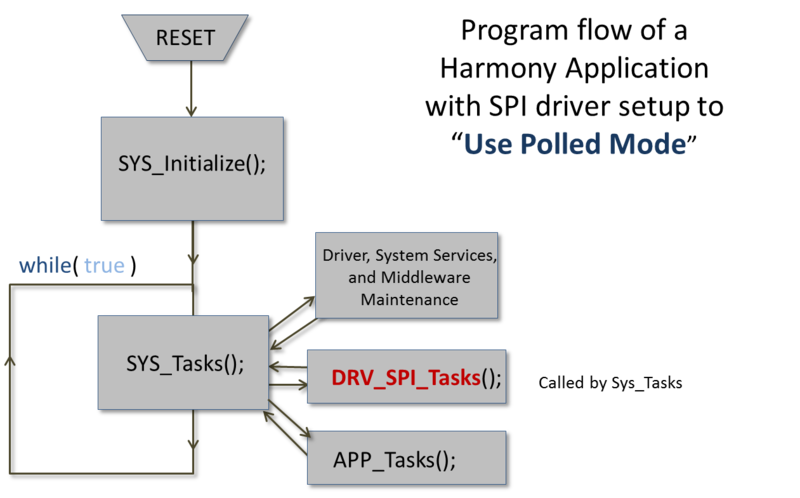 To have Harmony place a call to DRV_SPI_Tasks from SYS_Tasks the user will check the box "Use Polled Mode". Once the user has selected which mode to use, MHC will modify the Harmony source files needed for proper mode implementation. SPI uses 4-wires to communicate between a Slave device and the SPI Master. SPI Slave devices expect, and respond to, certain sequences of simultaneous signals (i.e., protocol) on the SPI lines. Due to the variety of protocols among SPI devices, Harmony does not attempt to implement any specific protocol. The Harmony SPI drivers will ensure the data packets are accurately delivered. It is the programmer's responsibility to ensure the content and sequence of the packets sent are appropriate. Send out the read command (03) with 8 clock signals. Receive the 8 bit response by sending out 8 'don't care' with 8 clock signals.